As we are moving deep into summer, we are also moving closer to the launch date of the next iPhone, presumably the iPhone 6S and 6S Plus. While the phone is highly anticipated, the phone itself was never a spec-power house. But things are about to change, as it seems like Apple is working with, out of all people, Qualcomm, to deliver faster LTE performance. The folks at 9to5mac got a snap of an internal prototype logic board. At a glance, it seems pretty standard. 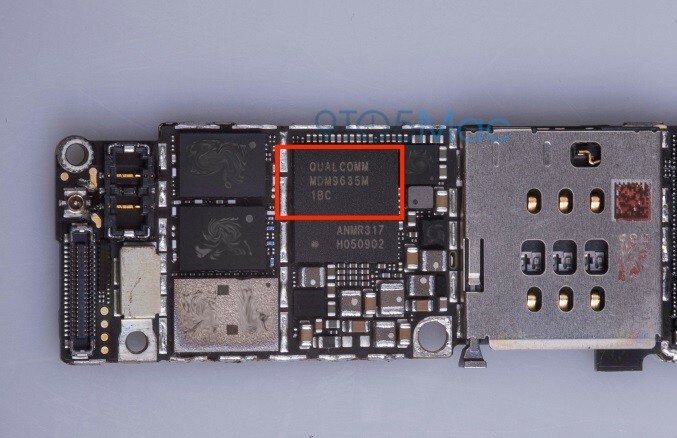 But look closely, we see a Qualcomm MDM9635m LTE processor, which has featured in devices like the Samsung Galaxy S5. In real world performance, the chip caps the upload speed at 50 Mbps, but the download speed can go up 225 Mbps, and the chip caps out at 300. Bandwith standard, among other things, includes DC-HSPA, EVDO Rev. B, CDMA 1x, GSM and TD-SCDMA. This chip is also a more battery efficient chip, which in turn, prolong the life of the already small battery on the iPhone.